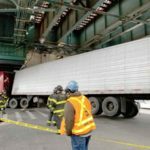 Emergency crews and city officials were on scene as a tractor-trailer got wedged under the elevated portion of the 6-Line. The incident was reported at 12:10 p.m. on Monday, March 12. 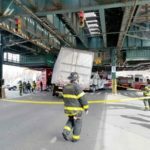 The truck reportedly struck one of the pillars at Westchester Avenue and Buhre Avenue that began to bend. 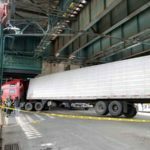 MTA crews were called out to inspect the damage and the truck was eventually towed away. Train service was briefly halted in both directions.